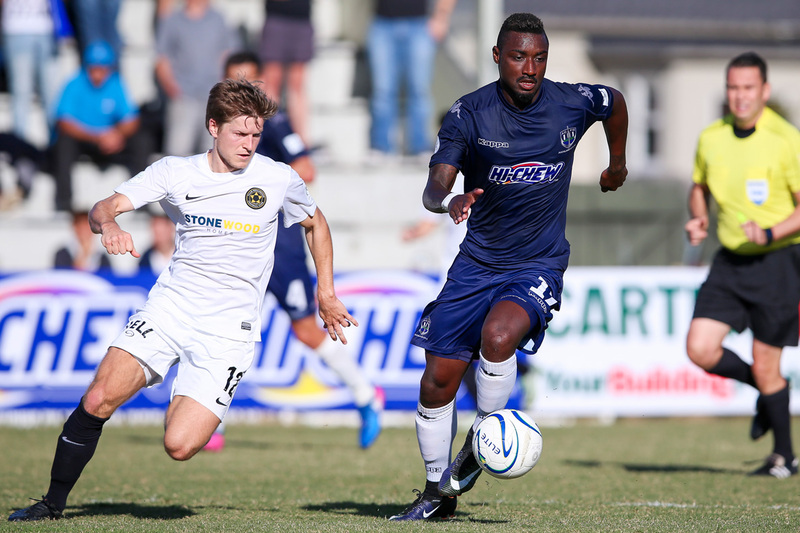 Team Wellington's Andy Bevin and Auckland City's Joao Moreira in the first leg of the OFC Champions League final. Team Wellington are gearing up for a score-fest against Auckland City in the second leg of the OFC Champions League final this Sunday, needing a minimum four-goal win over the six-time consecutive champions to claim the elusive title. Overthrowing the defending champions by any margin will be an impressive achievement given their current unbeaten record in the OFC Champions League so far. The Navy Blues have conceded only one goal in six games and have broken a record for the highest winning margin in the competition’s history, an 11-0 victory over Malampa Revivors in the group stage. Although Team Wellington’s assignment sounds near impossible, the three-time finalists managed to find the net seven times in their semi-final against AS Magenta at David Farrington Park only two weeks ago. In addition, they proved their ability to make an entertaining and impressive comeback on home soil in the semi-finals of the domestic league against Waitakere United. The two sides were locked 4-4 at full-time, then 6-6 at the end of extra time before Team Wellington sealed a 3-2 win on penalties. Making a return to their home ground for their last chance at a place in the FIFA Club World Cup UAE 2017, Team Wellington coach Jose Figueira is confident that his side can do it all again. “We’ve already climbed some mountains this season,” he said. “We’re more than capable of turning the result around. We’ve got to have that belief. We know that we’ve got goals in us. The three-goal lead has Auckland City in a comfortable position for the final leg, but the memory of Team Wellington’s 2-1 Premiership final victory over Auckland City is still fresh in the head of coach Ramon Tribulietx. Travelling to the capital for an OFC Champions League match for the first time, Tribulietx is preparing for a challenging match – this time without the support of the loyal Auckland City fans and instead the staunch Wellingtonians football community against them. “I think the psychological side of the story is going to be very important coming into the second game,” he said. “We’ve got a good advantage but it doesn’t mean anything in football. Anything can happen and Team Wellington have won a lot of games by a big margin. Vital Statistics: On average in the OFC Champions League, Team Wellington score 4 goals per match – or one every 22.5 minutes. The Players: Joel Stevens is a tough player to close down, he has speed and impressive ball control down the wing, putting in some tidy crosses for Tom Jackson and Ben Harris to finish. His precision with a free kick has also become an associated trait of his game style. Vital Statistics: Having conceded just one goal in six matches, Auckland City’s rate of goals scored against is one every 540 minutes in this year’s OFC Champions League so far. Up until the Leg 1 final, Team Wellington were conceding a goal a match in the competition in comparison. The Players: Joao Moreira’s showed his power in Leg 1 on the final and Team Wellington will be keen to close him out of Sunday’s game. His long reach and strength on the ball allows him to connect with power even while under pressure, and his combinations with Clayton Lewis and Darren White created a dangerous force up front for Auckland City. Auckland City FC: 1. Enaut ZUBIKARAI (GK), 2. Harshae RANIGA, 3. Takuya IWATA, 4. Mario BILEN, 5. Angel BERLANGA, 6. Cam HOWIESON, 7. Reid DRAKE, 8. Albert RIERA, 9. Darren WHITE, 10. Ryan DE VRIES, 11. Fabrizio TAVANO, 13. Alfie ROGERS. 14. Clayton LEWIS, 15. Mario ILICH, 16. Daewook KIM, 17, Joao MOREIRA, 18. Danyon DRAKE (GK), 19. Micah LEA’ALAFA, 20. Emiliano TADE, 21. Harry EDGE, 22. Abdullah AL-KALISY, 23. Marko DORDEVIC, 24. Jacob SPOONLEY (GK).